I just love the story when forgery appears in one of the world’s biggest sports and in the country of India, so don’t think forgery is just an American crime. In fact, since we started the national school we have had students in India and they submit work in Hindi, in all kinds of alphabets that I don’t understand personally, but the science behind forgery and forensic document examination does work in every language. But what’s great about this story is one of the largest sports in the world is called cricket. It’s not very familiar to our American readers but anyone in England, Australia, India and around the world will understand it. And anyone who ever has a child that plays sports would understand the motivation for trying to get his child to get on a top winning team. So what’s interesting about this story is one of the Goa Cricket Association’s vice presidents, he actually is accused of forging his own son’s birth certificate so that his son can play in the championship game and that’s because his son was a little bit too old to play with the kids his age. So you think it just happens in fraud and for $15 million in a court or a Ponzi scheme. Nope. It happens so your kid can play sports and win. Enjoy this article. Panaji: The Indian Cricket Board was on Saturday accused of turning a blind eye towards the alleged forgery of the birth certificate of his son by Goa Cricket Association’s (GCA) former vice President, Dayanand Narvekar. 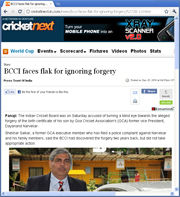 Shekhar Salkar, a former GCA executive member who has filed a police complaint against Narvekar and his family members, said the BCCI had discovered the forgery two years back, but did not take appropriate action. Based on Salkar’s complaint, the police on Friday filed an FIR against Narvekar, his wife Sushma, son Ganeshraj and two others. They have been booked for cheating, forgery and criminal conspiracy. According to the complaint, Narvekar, an ex-Goa minister, allegedly forged the birth certificate of his son Ganeshraj to facilitate his participation in an under-15 cricket tournament. “When BCCI realized that Narvekar had let his son Ganeshraj play for the third time in the U-15 category, the Board wrote to GCA. But he was fined a mere Rs 5,000 and let off,” Salkar claimed. Salkar said the apex cricket body in the country had failed in its duty by not taking action against Narvekar for such “gross misconduct and fraud”. The BCCI, in a letter dated April 25, 2008, signed by Chief Administrative Officer R S Shetty, and had expressed surprise about how Ganeshraj was allowed to play in the under-15 tournament in the 2007-08 seasons under the name Anish N.
“This is a clear violation of BCCI rules and calls for punitive action,” Shetty had said in the letter, according to Salkar. As per the complaint, Ganeshraj, after playing for two seasons – 2005-06 and 2006-07 – for the South Zone under-15 team, was allowed to play for the third time by changing his name. It said that Ganeshraj’s name was changed to Anish, his pet name, and a fake birth certificate was submitted to ensure his participation in the tournament. The complainant has also attached documents, obtained under Right to Information Act, showing that Ganeshraj had two different birth certificates. As per GCA record, his birth date is September 1, 1993, while the certificate procured from the local municipality shows his birthday as February 28, 1993. The complaint also stated that Ganeshraj has given another birth certificate claiming his birth date as February 28, 1992 to get admission in a school. When contacted, BCCI CAO Shetty declined to comment.